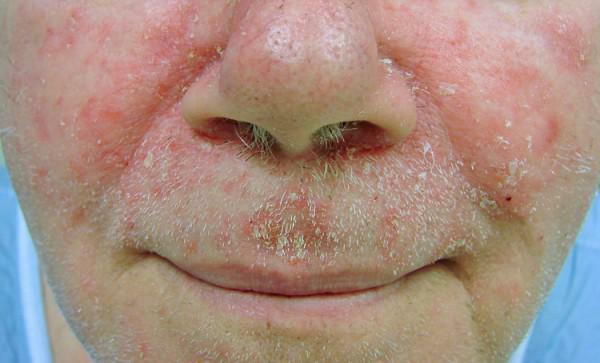 A 61 year-old female patient presented to our Pine Belt Dermatology complaining of a sore lesion on her nose (Figure 1). She stated that the spot had been tender and bleeding for several months and that it had been diagnosed as a cyst and treated with antibiotics. 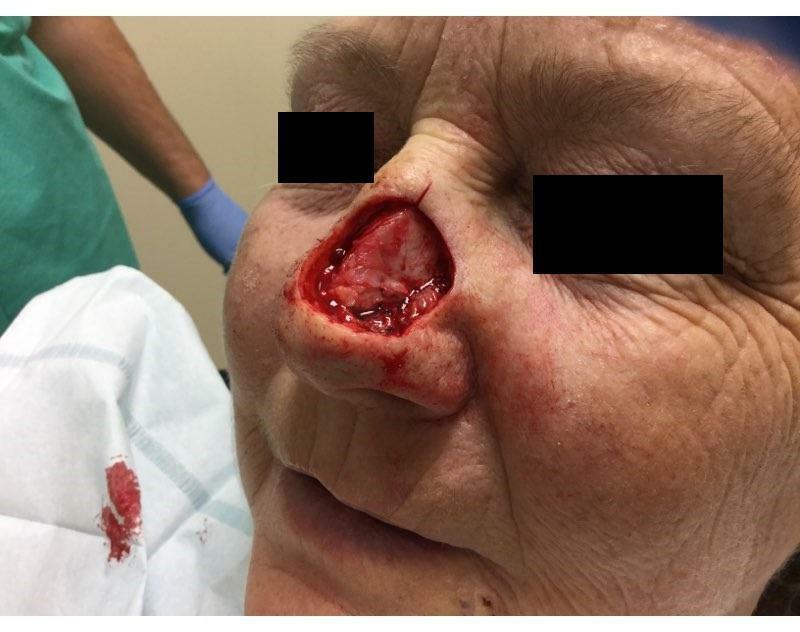 Despite treatment, the lesion demonstrated no improvement which caused the patient to become concerned and schedule a consultation. Kristen Richardson, PA-C was able to biopsy the lesion to get the patient an accurate diagnosis. A biopsy of the lesion revealed a cystic basal cell carcinoma. Basal cell carcinoma begins in the basal cells — a type of cell within the skin that produces new skin cells as old ones die off. Basal cell carcinoma often appears as a slightly transparent bump on the skin, though it can take other forms. Basal cell carcinoma occurs most often on areas of the skin that are exposed to the sun, such as your head, neck, and face. A pearly white, skin-colored or pink bump that is translucent, meaning you can see a bit through the surface. Tiny blood vessels are often visible. In people with darker skin tones, the lesion would be darker but still somewhat translucent. The most common type of basal cell carcinoma, this lesion often appears on the face, ears or neck. The lesion may rupture, bleed and scab over. A brown, black or blue lesion — or a lesion with dark spots — with a slightly raised, translucent border. A flat, scaly, reddish patch with a raised edge is more common on the back or chest. Over time, these patches can grow quite large. 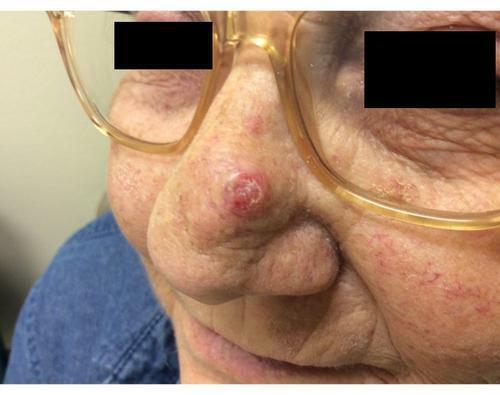 A white, waxy, scar-like lesion without a clearly defined border, called morpheaform basal cell carcinoma, is the least common. This lesion is easy to overlook, but it may be a sign of a particularly invasive and disfiguring cancer. After discussing treatment options including Mohs surgery, radiation therapy, and oral targeted therapy, the patient decided that Mohs surgery would be the best option due to its high cure rate. The surgery and microscopic evaluation of the tissue revealed a very large and aggressive tumor that had invaded deeply into the nose. The tumor was much larger than it looked and involved a significant portion of the nose (Figure 2). 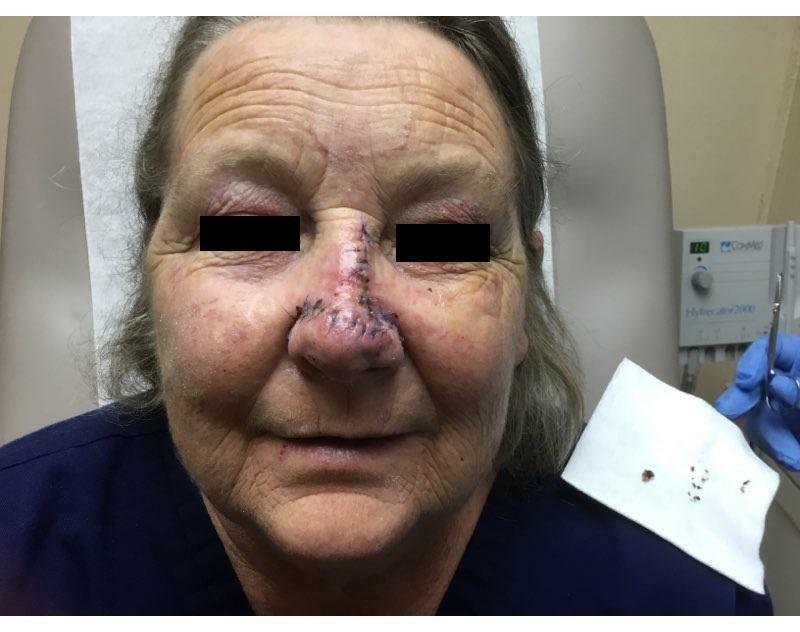 After discussing several closure options, including a flap and graft closure, the patient and I decided upon a rotation flap from the right side of her nose. This would allow for a single stage procedure, excellent tissue match in terms of skin texture and color, and relative quick healing time (Figure 3). After one week, the patient was seen for suture removal with excellent early results (Figure 4). 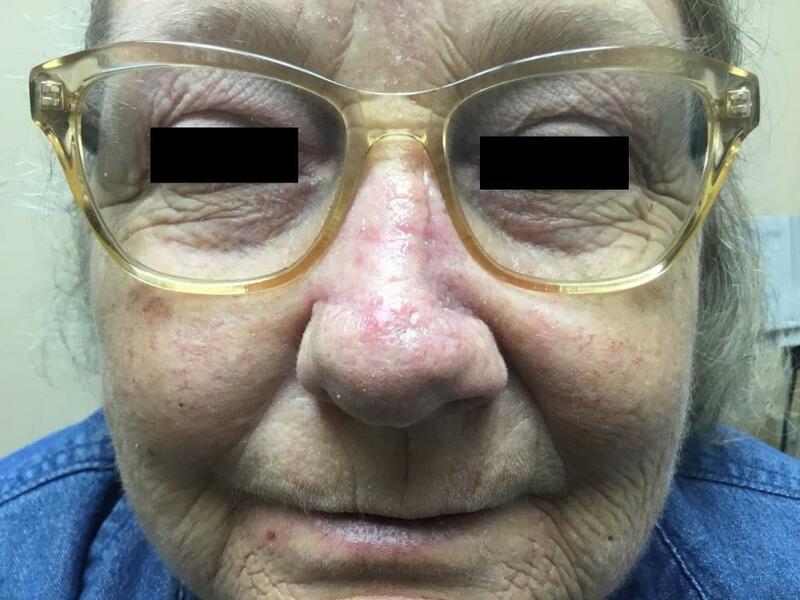 Three weeks after her surgery, her nose is centered and level, the tissue color and texture are appropriate, and scarring is minimal (Figure 5). 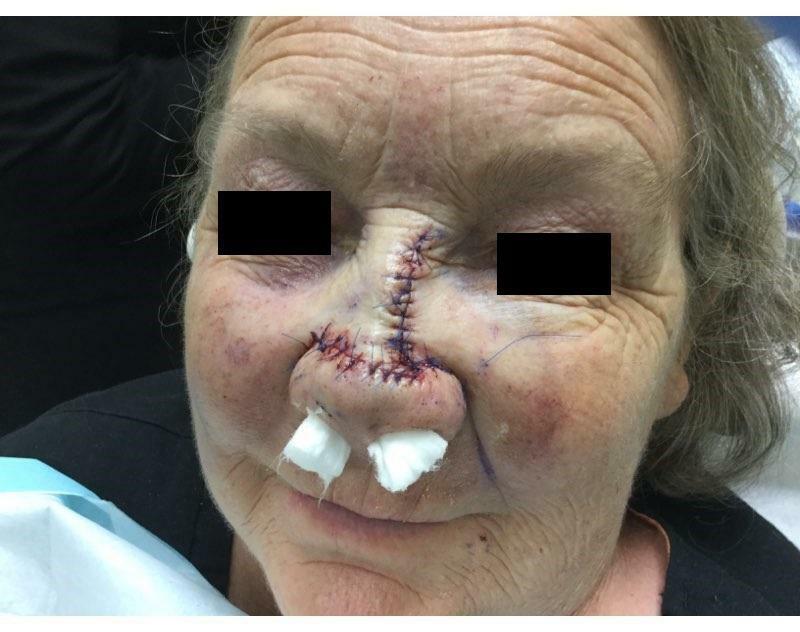 This case demonstrates the utility of flap closure, even for very large defects of the nose. It allows for the procedure to be completed in one day and requires only one week of downtime and wound care for the patient.